There’s plenty of games out there that inevitably slip under the radar. For Friday Freebies, we suggest a game every Friday that’s free of charge! When you boot up Startup Panic, the first thing you’ll notice is its bright, whimsical color scheme and cutesy attributes. It reminded me of a sleeker, pixelated version of Game Dev Tycoon. Even as you play through the game’s tutorial led by the annoyingly helpful Clippy from Microsoft Office, you’ll think, “Wow, this is so charming.” But while the aesthetic of the game is cutesy and nice to look at, the actual gameplay aspects leave much to be desired. In Startup Panic, you play as a new graduate pursuing their greatest dream, which is to run their own company. You start off in your house, and spend your days typing away on your computer. You program code, design websites and pursue contract work in order to keep your business afloat. There are a lot of menus and things to look at, but it’s all easy to understand. At the top of your screen, a series of gray boxes will indicate the date, how much cash you have on hand, how many users have joined your website and what your company value is. On the project tab, you can pursue contract work and also spend time refining your company’s website. 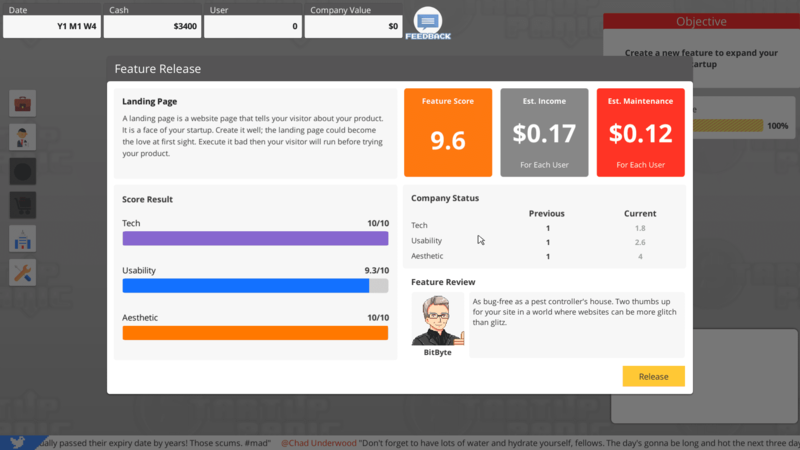 On the employee tab, you can review your employee’s stats, skills, and send them on vacation. The tutorial does an excellent job of walking you through everything so that you’re not overwhelmed. This shows the final outcome for your company’s landing page. As you can see, this person scored high on the tech, usability and aesthetic portion. If you happened to do this poorly, you have the opportunity to redo it in the future. After learning the basic skills, I was excited to delve into the game. I started off by building onto my website by adding user profiles, building text ads and improving other features. When I ran low on cash, I went on to do a little contract work. With each project and contract you take on, you have three key aspects to strive for: tech, usability, and aesthetic. The higher your scores are for each of these aspects, the more money you make, and the more clients you’ll attract. When I came across a job that was geared more towards ad design, I increased my aesthetic. If I came across something that required implementing HTML, I tried increasing my tech to get a better result. At first, this all seemed simple enough. I took on the obviously easy jobs and tried to cater to my clients’ needs. But even when I was doing well, I don’t know if my strategy was necessarily working. I guess it didn’t, because suddenly, I failed the next job I took on, even though it was supposed to be an easy one. This is where my downward spiral into startup hell began. When you fail a project or a contract in the game, your employees’ morale crashes. This makes them less motivated to work, and in turn they’ll keep doing a terrible job. After that, I tanked my projects and my contracts, and watched as my player got more upset. When you find that your player character is losing motivation, they may ask to go on vacation. A menu will pop up and interrupt your gaming experience to make this suggestion. In the demo, there are some vacation destinations that you can choose from such as getting a hair cut, which somehow requires being away from the office for one week. You can also choose to go fish or go on another major vacation, which will send you away for the longest amount of time. Each of these spends your company money, costing $100, $400, and $1000 respectively. But the payout – that is, the increase in morale – can be large if you’re willing to drop that much cash. According to the game’s landing page on itch.io, you’re supposed to be able to hire employees, but I’m assuming that because it was so early in the game, I was unable to. So, I was essentially sending myself away to blow huge amounts of cash and not earn any money for weeks at a time. 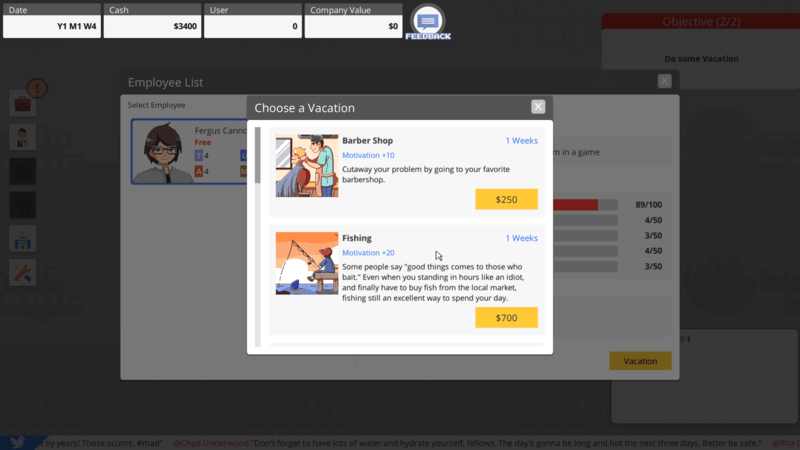 This is the vacation menu, which allows you to pick which employee to send on vacation, and choose their experience. I replayed the game twice, and came across the same issues each time. Obviously, this detracted from my gameplay experience. If I can’t make it through the tutorial, what does this say for the rest of the game? If the game can’t explain to me why my employee is performing so terribly in the first place, or how to choose jobs accurately, how am I ever going to be able to progress? Most of the tools included are useful, but there are some that I don’t understand. The bars at the bottom left hand side of the screen indicate your company’s “Market Share.” At the bottom, a Twitter feed scrolls across, but it seems pointless. Is it supposed to be there for comedic relief? Is it a tool which will help me track business trends, and give me hints as to what direction I should take my business in? Both of these features went unexplained during my gameplay experience. Aesthetically pleasing but buggy, Startup Panic has a long way to go, and might be a more enjoyable experience for experienced fans of tycoon and resource management based games. More features will be added to the game’s final version, which will hopefully make for an easier gaming experience. The demo allows you to play through the first four years of the game. You can get it for free on itch.io.